Despite all your lovely and generous comments on yesterday’s post, I felt my little birdie was crying out for something more and this morning I woke with another of my genius ideas – I could frame it – just to see how it looked. The frame measures 42 x 30 cm and the painting is 29.5 x 21 cm. Oh Joy!! Tra-la!! Happy Dance!!! 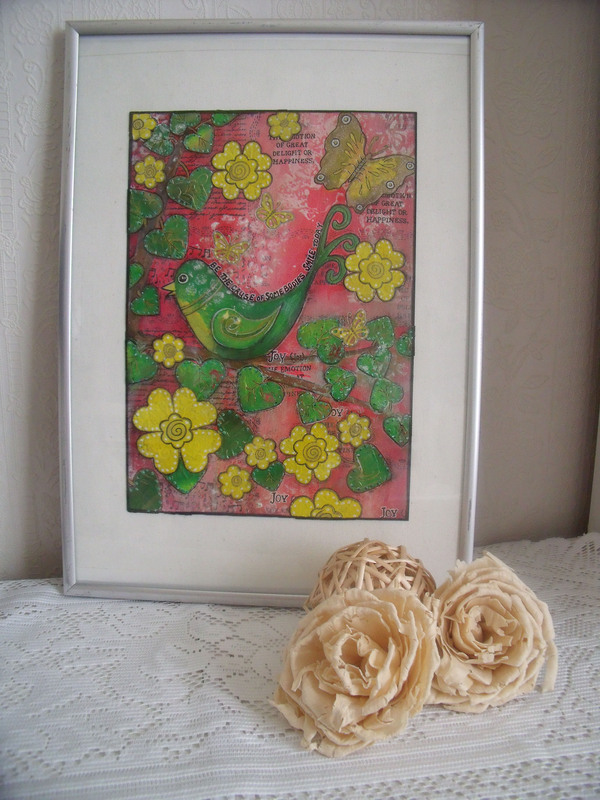 This entry was posted in Creations From My Craft Room, Creativity and tagged bird, framing makes all the difference, Mixed Media by thecontentedcrafter. Bookmark the permalink. I too missed this the first time … It looks great! Such talent! Have a wonderful holiday season!! Pauline, the art by itself is beautiful. The frame adds completeness. I like the placement of the cream colored roses. Elegant! It’s quite fun isn’t it! Hurrah for good ideas first thing in the morning!! The frame is the perfect highlight to your gorgeous bird…just wondering is it a partridge or a pheasant or a French Hen? ;). You are a wonderful artist and to me it looks just like one of the gorgeous wattle birds that land in the bird bath and splash around like crazy. I’m glad you like my colours – I’ve always been a bit od a ‘gaudy tart’ [my kids favourite nick-name for me] – I have no subtlety in me when it comes to colour. Hurrah! you finally managed to recognise her accurately too – turduckens are quite rare nowadays over here – obviously you have more of them in Tassie? Could your son-and-heir, who appears to be a brilliant young son-and-heir by the way, [simper, smirk] lay his hands on one? Know where they keep them? bring one home do you think? Print off a couple of turduckens as a trial? I suppose we’d have to cut him in too …… but that’s okay there are millions of Aussies not yet aware of the fact that they need nothing more than a turducken for their Christmas tree to make their lives complete…..
Oh yes – gurgles of happiness 🙂 make that two ‘gaudy old tarts’ and look out world…… Love your Miss Haversham! And your last sentence – Amen to that !! The birdie is quite successful I think – I shall have to play with variations on this theme….. Thanks Linne, your input is always appreciated! :-)…”nailed it on the head”..lol..just noticed that…yes, i have a mosaic problem with a project I am working on right now, and finally if I get the time I will complete the project, but I had some ideas that just were not working…so I do understand when it works out it is a wonderful feeling! I knew what you meant 🙂 I would love to do some mosaics one day – I often look at old broken pieces of china and think ‘Mmmm…mosaics’ and that is usually where it stops. Perfect. That white mat and frame really make it pop. Well done! Very nice. It is lovely framed piece. So professional in a frame! You say it was just laying around? Seems likes the perfect size and the white matt really puts it on stage. Makes a lovely impression Pauline! You are absolutely right Boomdee – on all points! All art [most art] is improved by the addition of a frame I think – and now this piece has certainly come together. I am the artist – 🙂 Thank you for coming by for a look – I’m glad to hear you like her too…. 🙂 I had a wee bit of trouble with this painting – the post before is full of my moans…. but now all is well again in my world 🙂 Amazing what a frame will do!